Published at $24.95 --- But now ONLY $9.95! 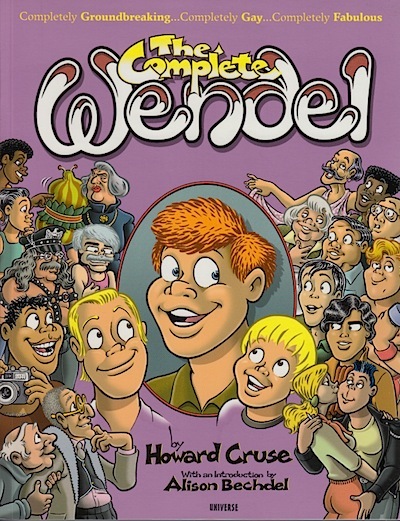 Originally published in The Advocate during most of the 1980s, Howard Cruse’s WENDEL is widely considered to be the first gay comic strip to be featured in mainstream media. A topical and heartfelt chronicle of one gay man’s journey through the often-rocky Reagan-Bush era, the strip became a seminal moment in comics history, and paved the way for an entire new generation of storytellers. This fat 288-page collection edition includes every episode as well as an all-new “Where Are They Now?” strip in which we see what Wendel, Ollie, Sterno, and the rest of Cruse’s beloved characters are up to today. Preface by Cruse and an Introduction by Alison Bechdel, National Book Critics Circle Award finalist for Fun Home.